Chris may be my first Doctor, but David Tennant is and always will be my favorite. Now I have seen pieces of Classic Who, including #4, but I'm sorry. I just don't like them. But, despite my adoration of David, I still can't deny that Chris was the first. Now I own several dvds of the classic and current series, a TON of action figures, a few books, and it's one of my top favorite tv shows EVER! Matt Smith was my first doctor but it was Christopher Eccleston who to me sucked into the show! He was such an amazing Doctor! yes I will never forget nine never I say! That would be mine! Thanks to my teacher for ever introducing me to this epic show! Sounds like a pretty awesome teacher! Matt was mine but I am so in love with 9! He's the only Doctor cool enough to have a Northern accent. I love him and will NEVER forget how he introduced me to the world of Doctor Who. Where's Eight? He was my first! He was my first and though I came to love many of the others (Still haven't seen them all but working on it) he will always be my fav. He will go down as my first and favorite because of it! I love Big Ears! I have been going back and watching his season and he really is a great Doctor! As much I like Tennant, I think Eccleston will always be my favorite. I took me forever to like the Tenth Doctor just because he took away the Ninth. My doctor left I'll always remember him! Nine was my first Doctor. 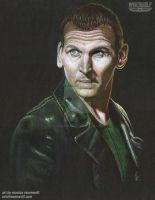 He has a special place in my Whovian heart... and perhaps I'm alone in thinking this, but I think that Chris Eccleston is up there in the "Best Doctors" list. Smith is my Doctor but I think all the past doctors are truly amazing. It took me a while to truly appreciate Eccleston though. Yeah, he didn't have a lot of time as the Doctor so I feel that some of that time was a bit wasted. They could have done 'Boom Town' so much better than they did. On the other hand, 'Dalek' and 'The Empty Child'-arc were done brilliantly. Yep, 9 will always be my 1st Doctor. If I could say one thing to Eccleston it would be, "thank you for such a good performance as Doctor Who!" Apparently, he had some kind of falling out with RTD. From what I've read, he never quite grew up with the Doctor in the first place, he just really liked RTD. So he asked him if he could be put on the list of possible 9th Doctors.